our fellow Nam veterans home...at long last. 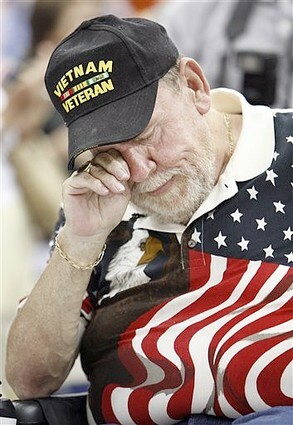 VIETNAM VETERANS GET A LONG-DELAYED "WELCOME HOME"
FORT CAMPBELL, Ky. (AP) — Tears filled the eyes of some Vietnam veterans who were warmly greeted with cheers from their family and friends Sunday in an re-enactment of their original return from the war, when they were often met with angry demonstrators and harsh headlines. The ceremony was a first for the 101st Airborne Division and the Army, said Maj. Patrick Seiber, an Army spokesman based at Fort Campbell inKentucky. "Our hope is that other units and other posts will follow our lead in having this type of ceremony," he said. Mickey Leighton, a 72-year-old Army veteran from Naples, Fla., said listening to the applause and praise from the community was very emotional. Leighton, who started his military career at Fort Campbell in 1956, served two tours in Vietnam including the Tet Offensive. He returned in 1972 in the midst of angry anti-war protests that often placed blame on the individual soldiers. "We were treated very shabbily," he said. "In some cases they would throw eggs at us, they would throw empty beer bottles at us and they would call us baby-killers." He said many soldiers would immediately change clothes because they didn't want to wear their uniforms in public in the late 1960s and early '70s while traveling home after returning from war. "Never in the history of the military have I known of any division or any military installation providing a specific welcome home for Vietnam veterans," Leighton said. "This is very touching." 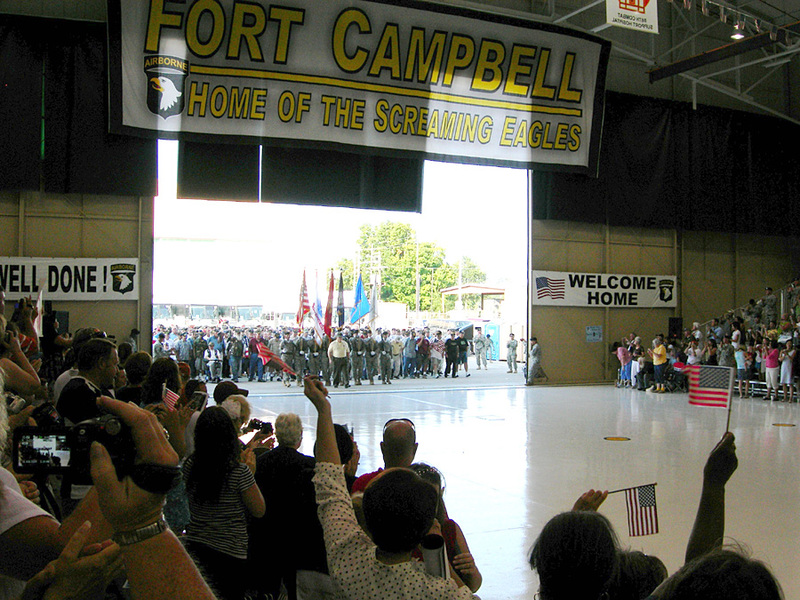 In contrast, Fort Campbell soldiers returning from Iraq and Afghanistan are welcomed back with a ceremony after every deployment, with many completing three or four tours since the wars began. Army leaders and the community around Fort Campbell collaborated for the Vietnam ceremony, Seiber said. The 101st Airborne Division Association, a group for former soldiers from the division, helped to organize and get the word out. "I can't think of a better community to do this in than the Fort Campbell community," Seiber said. Although many veterans had ties to Fort Campbell, the ceremonies included those from almost all the services. Many wore pieces of their old uniforms such as pins, awards and ribbons. Relatives filled the bleachers holding up signs that read "Welcome Home" and "Thank you for your service." Gene Jones, 67, of Louisville, went to war in 1964 and 1965 with the 101st Airborne. He spent two years in the hospital recovering after he lost his leg in the fighting. "The American public didn't support the war," he said. "I was there because I thought I was doing the right thing," he said. "Evidently I was doing the right thing because of the turnout like this. We were long due," he said of the ceremony. "It brings tears to your eyes." Maj. Gen. John F. Campbell, CG of the 101st Airborne Division, said the time had come to do the right thing. "We realize that many of you did not receive the honorable homecoming you deserved as American heroes," Campbell said. "We wanted to make sure that another day doesn't go by when you did not have a proper welcome home."